Something special happened to me with the creating of my “Matryoshka project”. It all started when I understood I want small and positive art to be my theme for a while, as I was a mother of a small baby girl and wanted to be able to focus for an hour on a painting but not much more. 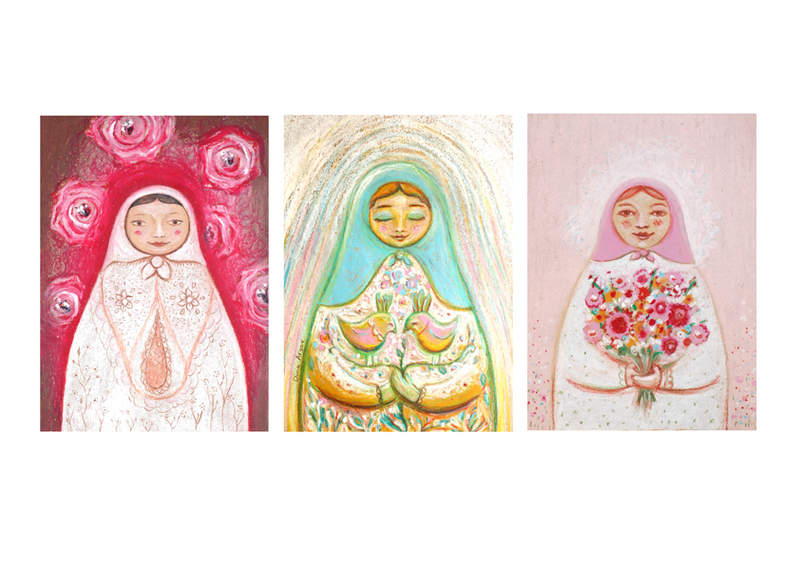 My love for folk art and my Russian origins (I was born in Saint Petersburg) suddenly took place in my world of images, and motherhood took over as a theme. So, Matryoshka illustrations was just the thing for me. I started painting on brown paper with oil pastels, because it was not much of a fuss and took little place and time, very effective and user friendly. In that time I was instructing a nice course of folk art from around the world for a group of women who just enjoyed my passion and we were actually discovering new themes together, trying to encode each culture and its special colors, design and style. There I created “The Mexican mother” and “The Morrocan bride” and many more. Even when the course was over and I had my second baby girl, I continued creating different Matryoshka’s, also on old pages of a German lexicon which added an interesting twist to the whole project for me. I was posting them on my Facebook fan page, and fans were asking for a long time that I will make a card set out of this illustrated series. So I just did it. 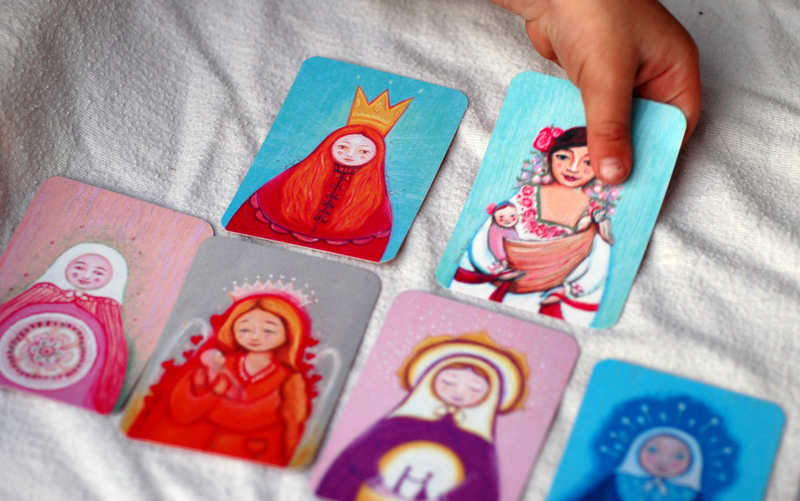 As I am a painter and not a therapist (at least not by the books), I wanted it to stay clear from words, so my images would talk and connect to the people who will use the cards. 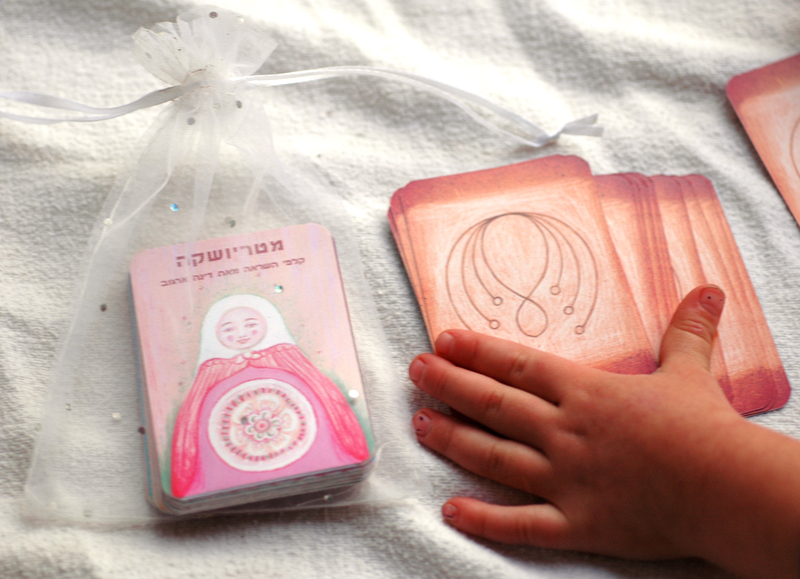 It was important for me that it will be a creative tool for group therapists and people who work with women in their clinics or in some special ceremonies such as birth circles or other women’s gatherings. So It comes free of instructions, and it is open for different kinds of activities, especially for telling a story using the cards. It’s still new out there in the world, and I am interested to see what will people make of it. One woman even took it to Africa, and found out with the cards that many of the young women there have the same question: “will I get married?”. Others tell me that they use it at the beginning of a workshop, as an ice breaker. The diversity of the Matryoshka and it’s many faces is a powerful tool for me in my creative process. Any time I can come back to creating a new one and it will be different every time and reflect my feelings. The thing with these Matryoshka’s is that they come out quite positive and kind, even though we all know there are other feelings too. But somehow they help me to see the bright side at the moment, during the process of painting them. I also created a 2014 Matryoshka calendar, and still have many pages at the old book that I want to paint on. There are also plans of making a tutorial as I know many of my followers would like one or two. Stay updated to see how it all continues. And please drop me a line, It will make my day.